Our caramel covered in milk chocolate and sea salt can only be called a BOG because it has no problem standing alone. Biting into this piece of candy sets taste buds in motion - no wonder it’s one of our top sellers. From Ginny of Woodbridge, Virginia on 12/21/2018 . These are absolutely the best caramel candy I've ever savored! If, like myself, you're the first one in the candy box to be certain you get the caramels, this is about to be your favorite candy ever. I'm 50 years old and this is the best chocolate covered caramel I've ever tasted! I'm also a he consistency person so it has to have the right texture as well as outstanding flavor and this little bog nails it perfectly! From Kirk of Raleigh, North Carolina on 1/1/2017 . If you love the taste of chocolate, caramel and salt, these will be your favorite. Rich chocolate, creamy caramel, and a sprinkling of crunchy sea salt. They didn't last long! I just ordered some for my family after receiving them in a gift basket. Highly recommended! From Winola of Augusta, Georgia on 4/15/2016 . Opposites attract! Very tasty, silky smooth little bite of delight. A caramel lovers dream. Thank you Droolin' Moose! You've got a winner. From Joseph of Burnsville, Minnesota on 3/8/2016 . 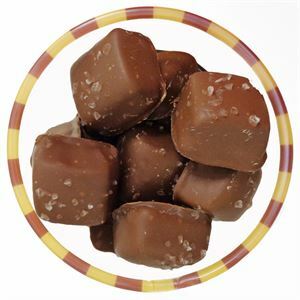 The salt gives these caramels an addictive element. Chocolate and caramel in these are top notch! From Gayle of Minneapolis, Minnesota on 3/5/2016 . This small square of delightful goodness is a pleasure I totally give in to by getting one cup a month. Buy enough and they give you one free so don't forget to get your card punched. Addiction developed at first taste.